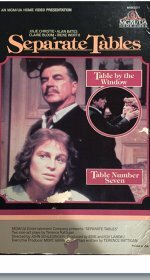 Julie Christie teamed with director John Schlesinger for the fourth and last time (to date) on this TV-movie version of the celebrated Terence Rattigan play that was first filmed by Delbert Mann in 1958. She's far too beautiful for the role of the mousey Sybil, but her hesitant performance just about stands comparison with Deborah Kerr's. Alan Bates, her co-star in Far from the Madding Crowd, is a touch too ebullient in the role that earned David Niven an Oscar, but it's clear the couple enjoy working together.